So it is almost mid-February… Which means Spring is just around the corner… and then Summer of course. 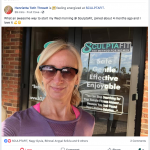 Subject: Review of SCULPTAFIT session experience, etc. It was lovely meeting you last week. As mentioned at that time, I definitely enjoyed my first SCULPTAFIT experience! Coach MaryAnne was WONDERFUL with instructing and guiding me into the correct alignment and such. I appreciated having her there to help!! There are many benefits to participating in small private group classes, and I enjoyed the group energy that was shared in class last Monday. But I also realized the one-to-one attention I was getting as well. Very comforting. The slow-and-mindful gentle movements that make up the SCULPTAFIT style, undoubtedly, align with the way I prefer to exercise. And although I exercise often, I could feel that “something special” — a sense of immediate toning and stimulation in my body — soon after class. The feeling lingered throughout the day and even into the next day. While I’m not sure of what the best description is to explain that after-class feeling, once you feel it, you just know it!! You can feel you did something great for your body! I’ve been in the fitness field for quite some time and I can surely say you guys are onto something incredibly special, effective and totally unique that so many women will benefit from, something I’d love to be a part of. We LOVE That Kind of Amazing Feedback! Every few months we open up a new “28-Day Women’s Fitness Turnaround” program… Sometimes we use a different name, depending on the time of year, such as the “28-Day Spring-SCULPT” we’ll start in March – but the unique essence of these gentle fitness programs for women remains the same. “At 57 years of age, the time spent this past month with your organization has been amazing, and yet another attempt to lose weight and regain muscle tone, and self-confidence. Having tried many workout and fitness programs in years past, I can surely say SCULPTAFIT’s unique method and approach have been in a word, “incredible”! Coming from a large Italian family, my family owned several restaurants, and food was a priority and viewed as a way to celebrate life, and console you. (NOT good). At age 21, I joined the U.S. Navy, which was a traumatic culture change, one filled with integrating with various people from across the U.S. I found myself getting up at 5:00 A.M. daily, staring at complete strangers, embracing a regime of intense physical fitness, marching, and a host of activities that were so foreign to me. I left Boot Camp fit and trim, after being forced into a regime I was never exposed to before. I was assigned to the Washington, D.C. area working in the Pentagon and feeling confident and inspired that I was doing something good for my life, serving my country, and finding my way. At 27 I was married and we moved to Japan for two years. My husband was deployed and I was in a foreign country for the first time in my life alone, no family no comforts and food. I had some health issues and could not get pregnant. After 5 years of trying I had my daughter at the age of 32. The first pregnancy ended in a “C” Section, which left me considerably self-conscious with an “apron” scar as a result . Filled with joy of being a mother, while still serving in the Navy, was a blessing and a curse at the same time. I had always wanted to be a mom, and the Navy, which used to be a major priority, was now an inconvenience and interruption for me to do what I ultimately wanted to do, and that was being a MOM. On the flip side, I again, put myself last. I became pregnant two more times, I lost one baby due to medical complications, and six months later had a healthy baby girl, leaving me in awe of having two daughters to love and mentor, and serving my country. We moved several more times which meant stress and emotional eating. Needless to say, having 3 C-Sections can do a number on your abdomen area, and simply never really recovered from them. I felt a sense of lost self-esteem, wearing baggy pants and shirts, etc., but somehow overlooked that, after all, I was a MOM! Again, I put me last. As time progressed I retired from the Navy, after juggling schedules, etc., I paid attention to my daughters and husband, and tried several diets and exercise programs, but had minimal results. Despite my attempts to diet and do virtually every possible fitness regime possible, I simply couldn’t lose the weight. After gaining a tremendous amount of weight and feeling self-conscious about how I looked and felt, I decided to have Gastric Sleeve Surgery, as somehow a last ditch effort to mitigate a life-long struggle with weight and fitness. Two years ago my mom, 87, came to live in the area, and now I am the caretaker for her, filled with daily runs to her facility, dealing with countless issues of insurance, health care, dementia, and all the while trying to provide dignity for my mom’s final chapter. During this time she broke her arm, I started doing everything wrong, emotional eating and, even began smoking again…. I was giving up -I felt hopeless. 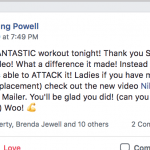 While checking out FaceBook one day I saw a SCULPTAFIT video and Joey explaining about this gentle and focused approach to weight loss and fitness for women in my age group. I was encouraged and responded to the ad. I was moved by the silent voice to do something and not give up, having failed so many times in the past. Since joining a month ago, I found SCULPTAFIT to be a new lease on life. It was precisely the regime, accountability, and motivation I needed to not only just get back on track, but to stay on track! The team here is incredible, they are kind, considerate, and motivating. The results thus far have been amazing, and I find my body firming, my posture more upright and confident, and I FEEL TREMENDOUS! I have rearranged the routine in my life because of it, and I make time for “ME”, changed my diet, and no longer buy junk foods or eat bad food that has plagued me for MY entire life. Eating for substance and not entertainment is what I remind myself consistently. SCULPTAFIT is precisely what I needed, and I now aim to continue in this life-changing program, filled with a unique approach to fitness, without fear of hurting myself in the meantime. After each session I feel alive, motivated, and proud of myself for taking control of my weight and making me a priority! I’m hopeful that I will not only regain the confidence and form from earlier days, but also to be a testimony for this program, the team here, and for other women in the community who are struggling as well with self-esteem, premature aging, being out of shape, and or have simply lost hope. Women must know… THERE IS HOPE! I thank you all for giving me a new lease on life! 2 – Or get in touch to see if we have any Complimentary Sample Sessions open this week or next week (these go very fast).